Telling manufacturers what you would like for them to produce requires precision, including a specific acceptable price range. The author describes the process he went through to build a diner/lounge car for the D&RGW "Royal Gorge" train. He started with an American Models model, but had to significantly modify it. Includes some photos. The author describes the first ever models produced in 1:64 scale. Includes photos of some of the surviving older models. The River Raisin GE 44-ton diesel switcher was designed to fit a Kadee #33 HO-scale coupler. The author describes what he did to get Kadee #802 S-scale couplers fitted to the model. The author describes the prototype SW-9 switcher, and covers how to spot the difference between it and the SW-1200 model that followed it. 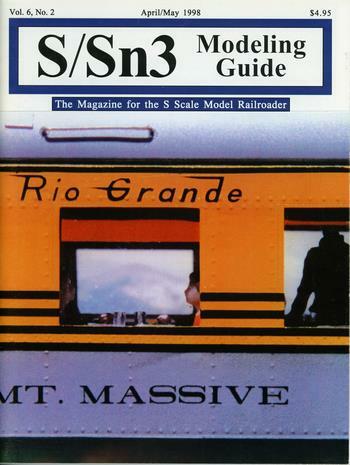 Includes photos of the interior and exterior of the S-Helper Service's model.